This report is for the exclusive use of Intertek’s Client and is provided pursuant to the agreement between Intertek and its Client. Intertek’s responsibility and liability are limited to the terms and conditions of the agreement. Intertek assumes no liability to any party, other than to the Client in accordance with the agreement, for any loss, expense or damage occasioned by the use of the report. Only the Client is authorized to copy or distribute this report and then only in its entirety. 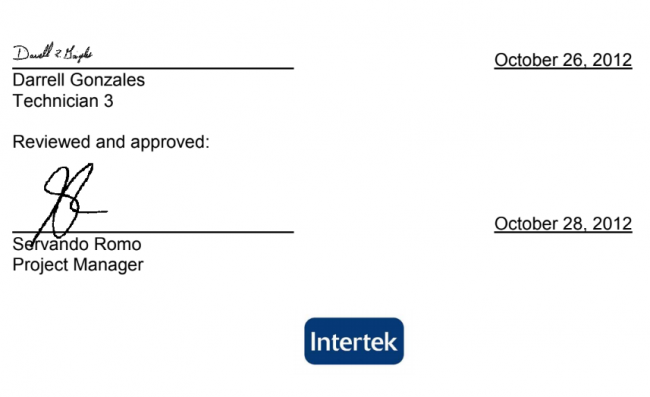 Any use of Intertek name or one of its marks for the sale or advertisement of the tested material, product or service must first be approved in writing by Intertek. The observations and test results in this report are relevant only to the sample tested. This report by itself does not imply that the material, product, or service is or has ever been under an Intertek certification program. This report describes the results of the ASTM E84-12 TEST FOR SURFACE BURNING CHARACTERISTICS OF BUILDING MATERIALS a method for determining the comparative surface burning behavior of building materials. This test is applicable to exposed surfaces, such as ceilings or walls, provided that the material or assembly of materials, by its own structural quality or the manner in which it is tested and intended for use, is capable of supporting itself in position or being supported during the test period. This standard should be used to measure and describe the properties of materials, products, or assemblies in response to heat and flame under controlled laboratory conditions and should not be used to describe or appraise the fire hazard or fire risk of materials, products, or assemblies under actual fire conditions. However, results of this test may be used as elements of a fire risk assessment which takes into account all of the factors which are pertinent to an assessment of the fire hazard of a par- ticular end use. 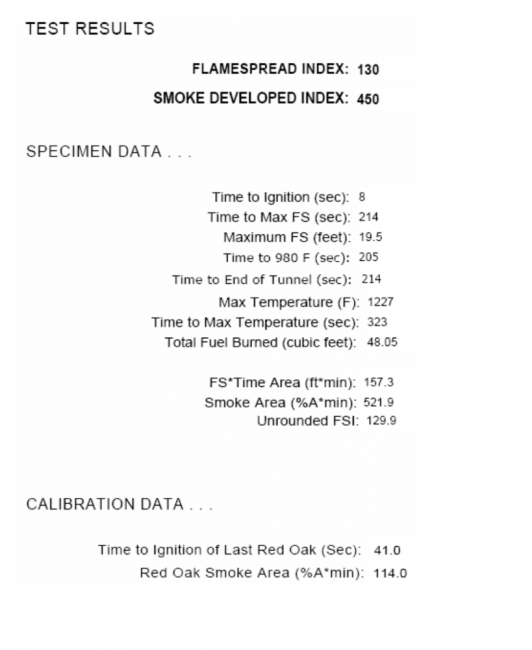 The ASTM E84 (25 foot tunnel) test method is intended to compare the surface flame spread and smoke developed measurements to those obtained from tests of mineral fiber cement board and select grade red oak flooring. The test specimen surface (18 inches wide and 24 feet long) is exposed to a flaming fire exposure during the 10 minute test duration, while flame spread over its surface and density of the resulting smoke are measured and recorded. Test results are presented as the computed comparisons to the standard calibration materials. The furnace is considered under calibration when a 10 minute test of red oak decking will pass flame out the end of the tunnel in five minutes, 30 seconds, plus or minus 15 seconds. Mineral fiber cement board forms the zero point for both flame spread and smoke developed indexes, while the red oak flooring smoke developed index is set as 100. The tests were conducted in accordance with the procedures outlined in the ASTM E84. The specimens are placed directly on the tunnel ledges. As required by the standard, one or more layers of 0.25 inch thick reinforced concrete board are placed on top of the test sample between the sample and the tunnel lid. After the test, the samples are removed from the tunnel, examined and disposed of. Specimen Description: The specimen was described by the client as “Florafelt Vertical Garden Planter”. The specimen consisted of nine 31.38-in. long plastic panels with a padded fabric on one side. The product was received by our personnel in good condition. 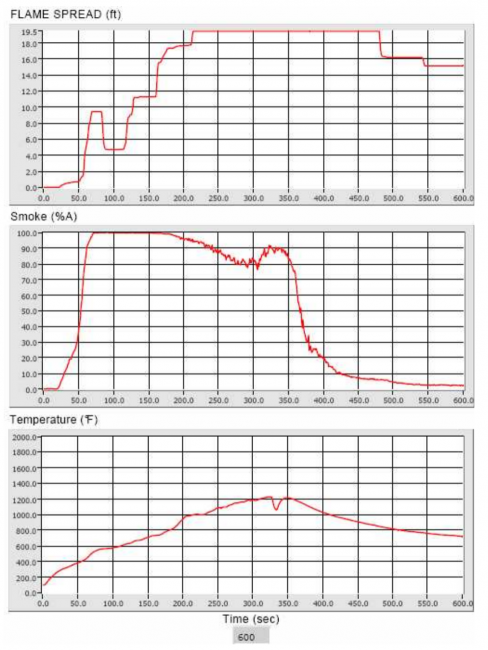 The test results, computed on the basis of observed flame front advance and electronic smoke density measurements are presented in the following table. The data sheets are included in Appendix A. These sheets are actual print-outs of the computerized data system which monitors the tunnel furnace, and contain all calibration and specimen data needed to calculate the test results. During the test, the specimen was observed to behave in the following manner. 0:00 The test burners were turned on. 0:08 Steady ignition was observed. 0:09 Melting was observed. 0:11 Falling was observed. 0:14 Flaming drops were observed. 0:17 Floor Flames were observed. 3:34 The flames reach the end of the apparatus. 10:00 The test burners were shut off. (FEET) Damage Descriptions 0 – 23.54 The specimen was consumed.